This page is about the effects of a splenectomy on adults. For children, see the page Splenectomy for children. Some people have conditions that mean their spleen doesn't work well. These include hyposplenism or splenic atrophy. Some people don't have a spleen. The information on this page also applies to them. 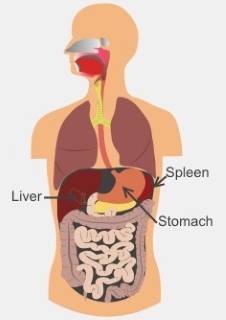 Splenectomy is the medical name for surgery to remove your spleen. A person's spleen helps them develop immunity against infections. It filters foreign substances from their blood, removes worn-out blood cells, regulates the blood flow to their liver and stores some blood cells. Your spleen is in the left side of your body, just under your rib cage, beside your stomach. Why do I need a splenectomy? People sometimes need an emergency splenectomy after an accident or injury that has damaged their spleen. The main risk after having your spleen removed is overwhelming infection. This is called post-splenectomy sepsis. You can reduce your risk of such infection by having vaccinations and antibiotics. After your splenectomy you will get advice about this. You will also get a medical alert bracelet or pendant, and advice on general precautions you should take. Children under 16 have an even higher risk of infection, and need special care after a splenectomy. If your splenectomy is planned (elective), your doctor will give you vaccines against certain infections before surgery, after checking your records to see which ones you have already had. Ideally, you will finish all your vaccinations two to four weeks before surgery. If your splenectomy was an emergency or you were not vaccinated before surgery, you should get vaccinated once you have fully recovered from the operation. You can get all your vaccinations from your GP or practice nurse. The vaccinations recommended after a splenectomy can change, but your doctor or practice nurse will check you are getting all the currently recommended ones. The health system pays for the vaccinations, but you might need to pay a consultation fee. It is important you continue to have any boosters your doctor suggests you have. You should also have a flu vaccination every year. daily antibiotics: amoxycillin 250 mg daily or phenoxymethylpenicillin 250 mg twice daily. emergency antibiotics if you can't get immediate medical care: amoxycillin 3 g, followed by 1 g every eight hours. Take the antibiotics until you can get medical care. If you have allergies to these antibiotics, your doctor can prescribe alternatives. Ask your pharmacist to write the expiry date of the antibiotics on the packet. Check regularly to make sure they have not expired. Remember to take your antibiotics with you when you travel away from home. flu-like illness with tiredness, aching, headache, vomiting, diarrhoea and/or stomach pain. See a doctor immediately if you are bitten by a dog, cat, any other animal, or another person. You are more likely to get an infection from a bite. You will need to get the wound thoroughly washed and dressed, and you may need extra antibiotics. Wear a medical alert bracelet or pendant, stating that you have had a splenectomy. Search online for medical bracelets NZ to find medical bracelet suppliers. You can also get an application form from your GP, or the department that arranged your splenectomy. Your GP or surgeon needs to sign the form. It's best not to travel to areas where malaria is common (such as parts of Africa and Asia). If you must travel to a place with malaria you must be extra strict with taking anti-malarial medications and avoiding mosquito bites. Make sure you get specialist travel advice. You should carry a splenectomy card with you all the time. You can get one from the Christchurch Hospital Haematology Department. Phone the department on (03) 364‑0384 during working hours to ask for a card. Written by Haematology Department, Christchurch Hospital. Adapted by HealthInfo clinical advisers. Endorsed by clinical director, Haematology, Canterbury DHB. Last reviewed May 2018.